These cards will surely spell your opponent's DOOM! The Zombie horde is coming! Structure Deck: Zombie Horde introduces powerful new Zombie cards to the Yu-Gi-Oh! TCG. Doomking Balerdroch leads the horde with its high ATK, its awesome effects, and its determination to turn the earth into Zombie World! Doomking Balerdroch is a Level 8 Zombie with 2800 ATK and 2000 DEF. Despite its high Level, it’s easy to Summon. Once during every Standby Phase (including your opponent’s Standby Phase), if a face-up card is in any Field Zone and Doomking Balerdroch is in your Graveyard, you can Special Summon Doomking Balerdroch from your Graveyard in Defense Position. 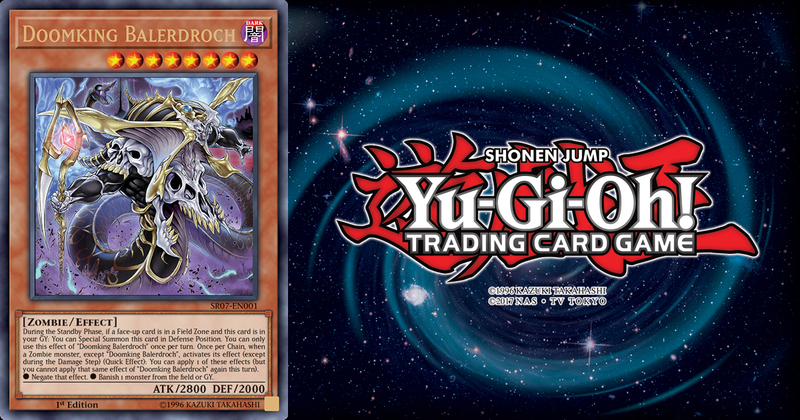 Drop Doomking Balerdroch into your Graveyard using Uni-Zombie, Foolish Burial or Gozuki, and you’ll be able to resurrect it each turn using its effect, as long as there’s a Field Spell Card on the field. Your opponent will find it impossible to permanently vanquish your undead monster! Although Doomking Balerdroch can be Special Summoned from your Graveyard while there’s any Field Spell Card on the field, its Quick Effect that can activate while it’s on the field works best with the Zombie World Field Spell Card. Once per chain, when a Zombie monster, except Doomking Balerdroch, activates its effect, you can use Balerdroch’s Quick Effect to apply one of two effects: (1) Negate that effect OR (2) Banish one monster from the field or Graveyard. Each of those two effects can be applied once per turn. Zombie World transforms all monsters on the field and in the Graveyard into Zombies. That makes it easy to use both of Doomking Balerdroch’s effects. While Zombie World is on the field, you can use Balerdroch’s Quick Effect once per turn to negate just about any effect that activates. Plus, while Zombie World is on the field, once per turn when any monster on the field or in the Graveyard activates an effect, you can apply Balerdroch’s other effect to banish a monster from the field or Graveyard. Without Zombie World, Balerdroch gives you a nifty way to banish your opponent’s cards once per turn when you use the effects of your Zombies. With Zombie World, Balerdroch virtually shuts down your opponent’s ability to use monster effects by making the consequences of using those effects dire. As an added bonus, Zombie World also stops both players from Tribute Summoning monsters, except for Zombies. 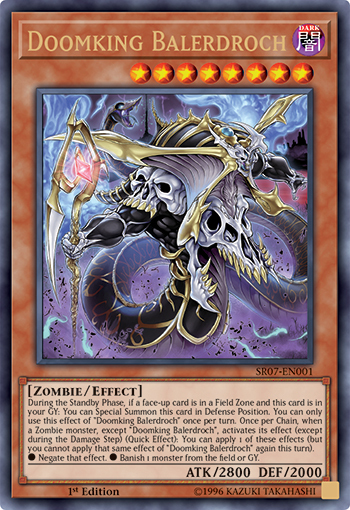 Although this part of Zombie World’s effect isn’t typically as impactful as the rest of its effect when Zombie World is used in Zombie Decks, if your opponent’s strategy relies on Tribute Summoning non-Zombies, like the True Draco monsters, it can come in handy to stymie your opponent’s plays. Structure Deck: Zombie Horde and Doomking Balerdroch make Zombie Decks stronger than ever before! You can get Structure Deck: Zombie Horde on November 2!